Welcome to the first “Cookbook of the Week” post, my way of trying out new recipes and feeling less guilty about all those unused books on my shelves. First up to finally get used is “What’s for Dinner?” by Fay Ripley. I got this book as part of my big stash of cookbooks for Christmas 2012 (I got nine). I’d asked for it having happened on Fay Ripley’s other title “Fay’s Family Food” in the library and was impressed, and the title of this one pulled me in. If you’re racking your brains trying to figure out where you know Fay Ripley from, let me put you out of your misery, she played Jenny in Cold Feet, a very popular ITV drama in the ’90s…Remember? So, to the book, the tagline of the book is “Easy and delicious recipes for everyday cooking”. They had me at easy, delicious was a bonus. The layout is simple and clear with a photo opposite each recipe. For me photos are a very important part of a cookbook and I’m disappointed if I don’t have something to visualise what I’m aiming for, whether I manage to achieve it or not. The feel of the book is down to earth, the recipes are very simple to follow and written in Ripley’s chatty style, with some naughty comments thrown in to spice things up. I love the idea of “Cornershop” section but as she says herself in the introduction, not all cornershops might be as well stocked as hers, and I’m unlikely to find fresh mint or raspberries in mine. Many of the recipes have little tip boxes- “Baby Biz” and “Kids Stuff” and “Time Tip”, and these really are useful little tips, as opposed to stuff you should know already as a lot of these “tips” are. The dishes are simple family food, with little tips on how to make them more kid or baby friendly. I found myself tagging page after page of recipes that got me interested, dishes that I could imagine making and feeding my family, dishes that I imagined that they would eat, and that I could imagine finding the ingredients in my local supermarket. I managed to try three different recipes this week and have more that I’m determined will get an outing. Big Green Salad– it just doesn’t dawn on me to add peas to a salad and I’d never served raw courgette before, but this recipe has me converted. Trout Puff Parcels– I tried this but my puff pastry pack was bigger than Fay’s so my parcel wasn’t full enough, I’d try it again but I’d cut the parcels smaller. Baby Toads in Baby Holes– we loved these. Kids being kids, mine love sausages. The recipe is simple and my five year old having been given three wanted a fourth one. I used cocktail sausages as chipolatas aren’t easily available where I live. We’ll definitely make this again,- the recipe is available here from Red Online. My “to try list” still includes smoked salmon and goatscheese risotto, Pear Pudding, Spanish Baked Beans, her Quick Fish Dish and Spinach and Ricotta Pasta Shells. Oh and the Aunt Aggie Dessert, and Lemon Raspberry Tart, Salmon with Pea Sauce. And and and. It’s testament to how much I like this book that I’m loath to leave it to move on to my next cookbook of the week. In Short: Perfect for easy family food, includes dinners, baking and sides, easily accessible desserts. The Verdict: I was right to want this so much and should use it more! If you have any books you’d like me to look over with fresh eyes for my Cookbook of the Week feature let me know. 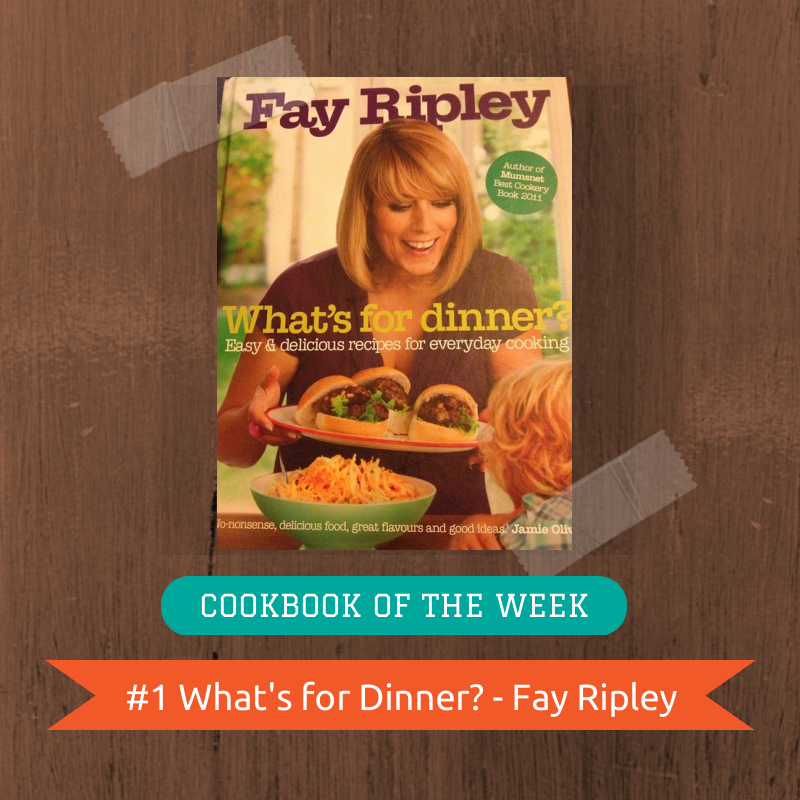 cookbook of the week, Fay Ripley. Bookmark.